India has become the latest in more than 40 countries to have access to Univadis, a healthcare education and information produced by Merck & Co. The website, launched in 2001, is free to healthcare professionals and has been developed in conjunction with London-based medical publication The Lancet. It gives users access to exclusive content such as articles, news, research papers, videos and other educational tools. "We are launching a unique online medical education service to aid comprehensive healthcare management, making available unbiased, reliable scientific medical information," said KG Ananthakrishnan, managing director of Merck's Indian subsidiary MSD Pharmaceuticals Pvt. “This unique medical education service to support comprehensive healthcare management will provide Indian doctors with updated information to expand their knowledge and expertise”. It is hoped that Merck's move will help health professions in India, where providing continued medical education for doctors remains challenging. At present, Indian doctors' medical knowledge is either not updated frequently enough or they find themselves dependent on sponsored conferences for their ongoing education and access to news of industry developments. 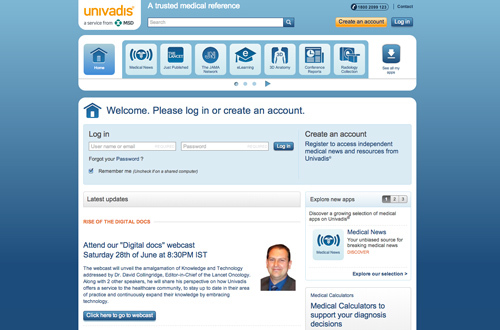 “Our partnership with Univadis offers a unique opportunity to increase delivery of the best science to Indian doctors in free and easily accessible format,” added David Collingridge, publishing director for Lancet specialty journals.